May 19, 2016 ~ NickyB. I recently signed up and ordered a card from a local police department. 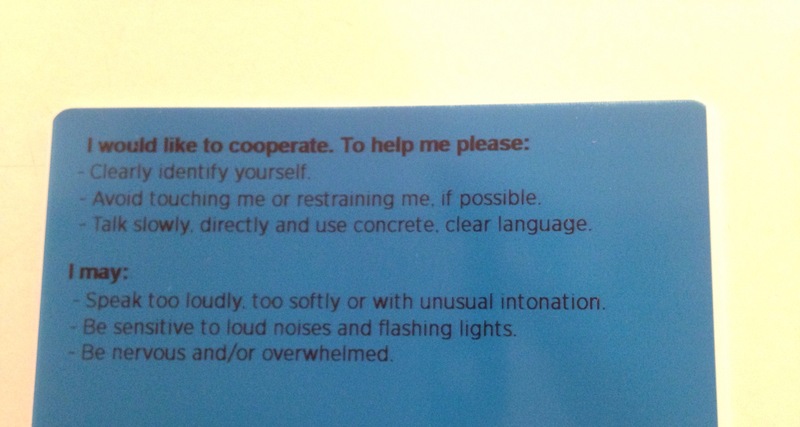 This particular card is one in which people with autism can carry in order to identify themselves as autistic and communicate clearly with law enforcement. The card even comes with a stress-sensing biometric strip that changes color according to a person’s level of stress. At face value this sounds great! After all, if MJ is ever stopped by an officer he can give them something that will help him interact with them. 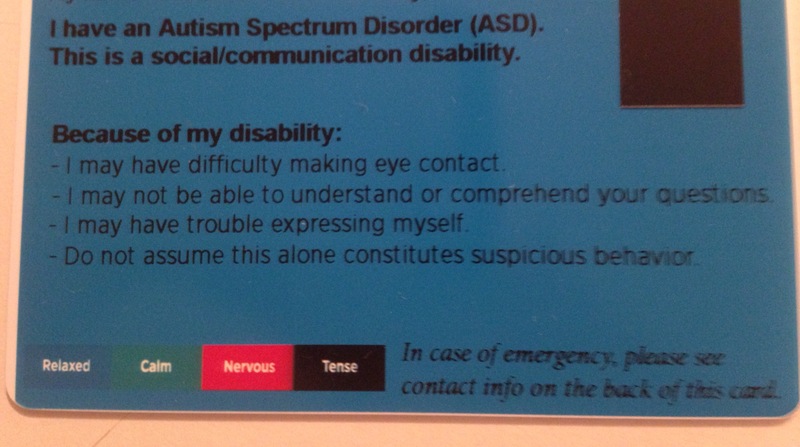 The question is, “HOW CAN I SAFELY TEACH MJ TO USE THIS CARD WITHOUT GETTING SHOT?” One of the rules on the accompanying brochure says, “As soon as possible, TELL the officer that you have a disability card and ASK if you can show your card.” As it stands right now, MJ would never TELL or ASK an officer anything. He would probably get nervous and reach for the card in his pocket! The thought of that makes me very frightened. I don’t want him to appear threatening at all. We all know that putting your hands in your pockets without informing them why you are doing so, is never a good idea. That being said, I am still glad that we received the card but it may be years before MJ really knows how to use it correctly. However, it is most definitely something that he must learn to use and use wisely. This is a concern for me and I have not been able to come up with any clear solutions on my own. Having a male child, the idea of his potential interactions with law enforcement does stress me out. I think the card is a good idea. I think I may have one of those med-alert bracelets made for my son to identify him as autistic and pray law enforcement is trained to at least look for them. As the number of affected people increases I pray government officials are taking note and making changes to minimize traumatic outcomes. Wasn’t aware this card existed. It’s a great idea but as you mentioned police should be made aware. If I hear of how others are teaching their kids how to use this card I’ll let you know. I think that the card and the medical alert bracelet are great ideas but the police force must be educated not to assume that every Black male is a thug or criminal. Most of the problem lies within the racist and bigoted attitudes of the police department. Every brown skinned male is perceived by them as a threat. There need to be programs in place in every city to alleviate this problem. Pretty much Stephen is chaperoned to and from every place he has to be but I don’t even want to entertain the thought of him becoming separated from his group, care-taker or even me!! Also Stephen is pretty much non-verbal unless you ask him a question so I don’t think the card would do him any good. He does not initiate conversation. Stephen is also very trusting. He would look for me but would go with anybody who is nice to him. Unfortunately Stephen thinks every one is a friend!! Alarming. When he is with me I keep him very close. We just have to do what we can to protect them. Always. Perhaps it can be worn around his neck, like on a lanyard? Great idea. That may work! Perhaps it can be worn around his neck, like on a lanyard. Could you perhaps put it on a string or something that he can wear around his neck – put it under his shirt and if he needs it, he can pull on the string to get it out? Might be less likely to get misconstrued??? My good friend and fellow blogger Deborah of “dancingpalmtrees” informed me of your blog and asked me what I thought. 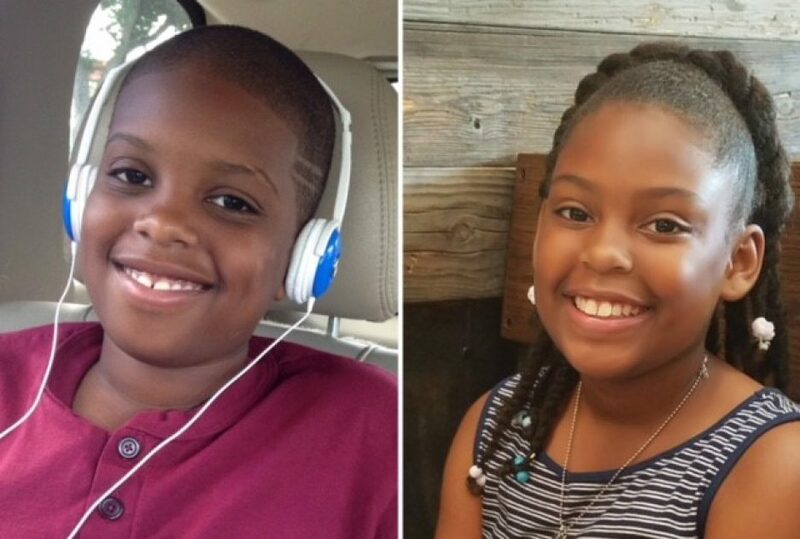 My wife and I have two boys who have been diagnosed with ADHD, Asperger and a Mood Disorder. I love the use of an ID card and or a bracelet. However, I believe law enforcement must get serious about training and changing their overall attitude towards men of color. At times I think of what our boys may face in life. However, I will not allow fear to paralyze me or instill fear in them. NickyB my name is Pastor Lionel and my blog is lionelsneedministries.com. Thank you for sharing your heart. Thank you for your comment! I agree that we need to do what we can and then leave the rest to God. I trust in him. Thank you for reading! Serious and scary stuff. Makes a mama’s stomach hurt. I’m hoping that if and when there comes a time that my son will be on his own somewhere that he may have to interact with police things will be different. Different in that the police will be more aware/ more understanding/better trained. And different in that my son will be able to express himself in a way that they can understand and not make the situation worse. As it stands right now he is never without adult supervision during the day and isn’t a wanderer. Tell me about it. This is the stuff that keeps me up at night. More education and training is definitely necessary. MJ wanders at times. Thankfully we have always been there to make sure he stays with us but it is still so worrisome. Gotta keep advocating and praying. Wow. Very eye-opening and scary as well. However this is a great thing for him to have in the event he ever needs it. I pray that moment never comes, but if it does MJ will be old enough and able to communicate effectively. The lanyard idea is a good one! I will keep your son in my thoughts and prayers! This card is an excellent idea, but you’ve raised a lot of good questions. I wish I had an answer! Maybe you can meet with someone in law enforcement and hear what they think? They might be able to offer some suggestions based on their experiences and training. Actually, as I’m typing this I’m thinking it would be wonderful for local police/fire departments to meet with their local Special Ed departments… think about all the different needs out there, and how kids of all ages could benefit from law enforcement being educated and trained to accommodate their needs as best they can. What a wonderful idea. It would really benefit everyone. Sounds like something I really need to work towards! The lanyard idea is what I would do as well. I didn’t know these cards existed; will be looking in to it for sure! Thank you for this post. It’s so sad that a parent has to be burdened with this kind of worry atop so many other worries to deal with. The card and bracelet is an excellent idea. I just wish the police in the US could get their acts together. I recall how much discomfort I used to feel when my son or husband was outside the home especially when the shooting incidents became too rampant. They just need to stop and get informed.